Attach this visual to your site's perimeter boarding or fencing, to ensure anyone about to enter your site is made aware of the dangers and the rules that apply to both visitors and contractors. This safety visual makes anyone entering the site aware of the speed and parking restrictions, as well as heavy plant and machinery precautions. Attach this large (3ft x 4ft) heavy duty PVC banner to your site's perimeter boarding or entrance way to ensure anyone about to enter your site is made aware of the dangers and the rules that apply to both visitors and contractors. Imperative to any construction site is the SITE SAFETY banner. Attach this large (3ft x 4ft) heavy duty PVC banner to your site's perimeter boarding or fencing, to ensure anyone about to enter your site is made aware of the dangers and the rules that apply to both visitors and contractors. This sign ensures anyone about to enter your construction site is made aware of the dangers and the rules that apply to both visitors and contractors. 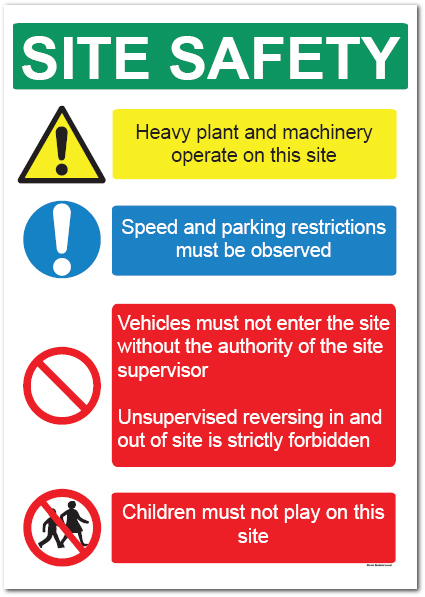 This safety sign makes anyone entering the site aware of the requirement for hard hats, safety boots and high visibility jackets, as well as the need to report to the site's office to sign in and receive information on the rules of the site. This BS approved sign ensures anyone about to enter your construction site is made aware of the dangers and the rules that apply to both visitors and contractors. This safety sign makes anyone entering the site aware of the requirement for hard hats, safety boots and high visibility jackets, as well as the need to report to the site's office to sign in and receive information on the rules of the site. Use the Foot Protection Must be Worn in this Area safety banner to enhance your company safety awareness programs. This banner has been designed to grab attention and clearly communicate the need for foot protection. This banner is regularly purchased by the likes of Health & Safety professionals, Plant Safety Officers, Supervisors / Team leaders and Managers.